It's 4 A.M. Your men are dog tired. They're desperately trying to take a bridge. They're under heavy fire. Casualties are mounting. You order your armor to move up. Two platoons of infantry to follow. But some of your men won't budge. Some are even retreating. You've got to take that bridge and time's running out. What do you do? You're in command. But your men have minds of their own. 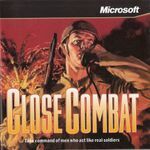 With Close Combat you command soldiers who react realistically to the situation they're in and are dynamically affected by their ability, strength, stamina, and mental condition. Experience the heat of battle with continuous real-time action. Keep your eyes open and your head down. Great graphics, animation, and sound effects help make the battlefield come alive as you command the Americans or the Germans. Test yourself on the battlefield under authentic conditions. See how well you command under the same conditions faced by World War II commanders as you fight through historically accurate battle situations. Deploy realistic weapons, vehicles, and troops that come with detailed information on each.